10 for 10 Sheet Music editions are the smartest, most economical choices for building your music library. Grow your repertoire and have lots of fun playing great new material, all for only 10 dollars! 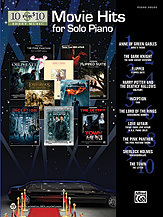 Movie Hits for Solo Piano contains superb piano transcriptions of themes by a variety of Hollywood’s most renowned film composers—from classics by Hagood Hardy, Henry Mancini, and Ennio Morricone to today’s blockbuster scores by Alexandre Desplat, Howard Shore, Hans Zimmer, and more. Titles: Anne’s Theme (Anne of Green Gables) * The Dark Knight Overture (The Dark Knight) * Flipped Suite (Flipped) * Obliviate (Harry Potter and the Deathly Hallows) * Time (Inception) * Concerning Hobbits (The Lord of the Rings) * Theme from Love Affair (a.k.a. Piano Solo) (Love Affair) * The Pink Panther Theme (The Pink Panther) * Discombobulate (Sherlock Holmes) * The Letter (The Town).